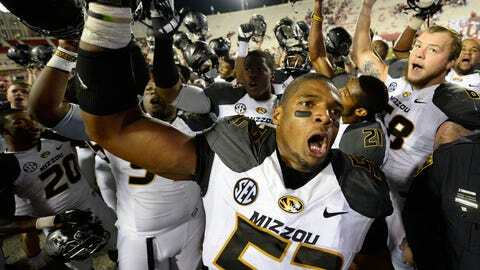 Michael Sam has been the heart and soul of the Mizzou defense. Defensive end Michael Sam’s breakout season got off to a slow start. So slow, in fact, you might not have noticed him as he went without a sack in each of the Tigers’ first three games. Then came Arkansas State. Sam, who entered his senior season with 9 1/2 sacks in three years, broke out with three sacks against the Red Wolves and took off from there. By the time the regular season was over, Sam had produced one of the best seasons of any defensive player in the country. ‘Tis the season for college football awards, and the honors have been rolling in for Sam and other Mizzou players. Clearly, Sam headlines the defensive players who were most responsible for the Tigers’ 11-2, SEC East championship season and Cotton Bowl berth. Yesterday we looked at the five most valuable players for Mizzou on offense. Today we present five defensive players who stepped up and made the biggest difference for the Tigers this fall. 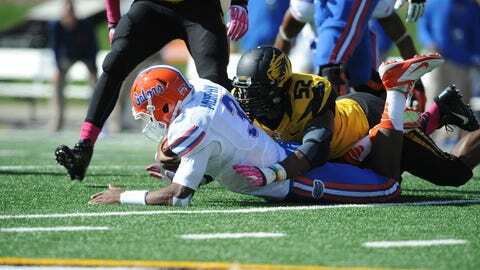 Michael Sam led the SEC with 10 1/2 sacks and earned All-America recognition. Sam’s performance against Arkansas State kicked off a four-game stretch in which he racked up nine of his team-high 10 1/2 sacks. He had three sacks against Arkansas State, three at Vanderbilt the next week and then three more two weeks later against Florida. The fifth-year senior finished with 45 tackles (a team-high 18 for loss), nine quarterback hurries, two pass break-ups, one forced fumble and one fumble recovery. His sack and tackle for loss totals were the best marks in the SEC and rank among the top 10 nationally. Mizzou coach Gary Pinkel said several times over the course of the season that Sam’s play along the defensive front raised the bar for his teammates. The Tigers’ defensive line turned out to be one of the biggest factors in the team’s turnaround season. Sam’s season has earned him plenty of accolades, including SEC Defensive Player of the Year by the Associated Press, SEC co-Defensive Player of the Year by the league’s 14 coaches and an All-American by USA Today. He also was a finalist for the prestigious Lombardi, Nagurski and Hendricks awards. Among E.J. Gaines’ many big plays was a fumble return for a touchdown against Auburn in the SEC title game. The cornerback entered his senior season already established as one of Mizzou’s top defensive players but still with something to prove. After being selected to the All-Big 12 first team in 2011, as a sophomore and first-time starter, Gaines earned no postseason accolades from the SEC following his junior season. The cornerback lived up to his reputation during his senior campaign and made an impact on the Tigers’ successful season, despite missing two games with a quad injury. 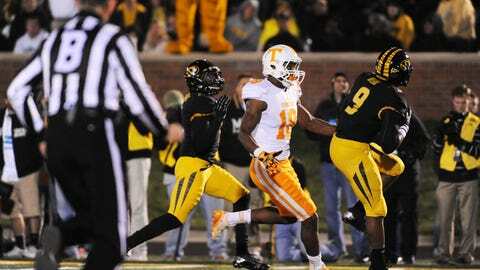 He led Mizzou with four interceptions and was third with 68 tackles. He also recorded four tackles for loss, two pass break-ups, one fumble recovery and one quarterback hurry. Gaines’ finest moment came against Texas A&M, when he limited Aggies standout wide receiver Mike Evans to four catches and a career-low eight yards. Evans entered the game with back-to-back 1,000-yard seasons. Andrew Wilson is close to breaking his father’s school record for career tackles. The man in the middle, Wilson was one of the better stories for Mizzou this season. A second-generation Tiger, he was a big part of the team’s turnaround from five to 11 wins (and counting?). Wilson’s family certainly has much to be proud of. The hard-hitting middle linebacker led Mizzou in tackles for the third consecutive season and could surpass his father Jay’s mark for tackles in the Cotton Bowl. Jay Wilson recorded 323 tackles as an All-Big Eight linebacker from 1980-83 and left the school as the all-time leader (he now ranks 12th). Andrew goes into the Cotton Bowl with 317 career tackles. 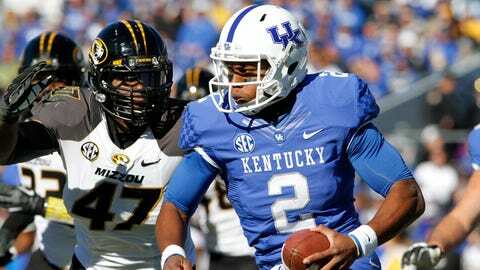 Wilson, who was recognized as a second-team All-SEC selection by the Associated Press, has a team-high 98 tackles, including six for loss, to go along with three pass break-ups, two quarterback hurries and one fumble recovery. Kony Ealy established himself as one of the best defensive ends in the SEC this fall. Ealy established himself as a player to watch as a redshirt sophomore a year ago, when he recorded 37 tackles, including 10 for loss, and 3 1/2 sacks. He stepped up his play even more this season and, like Sam, established himself as one of the best defensive ends in the SEC. Ealy recorded 37 tackles, including 12 1/2 for loss, 14 quarterback hurries, 7 1/2 sacks, five pass break-ups, three forced fumbles, one fumble recovery and one interception, which he returned 49 yards for a touchdown against Indiana. 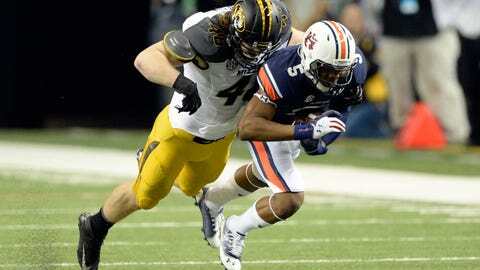 Two of Ealy’s forced fumbles were against Auburn in the SEC Championship Game. The AP named him a first-team All-SEC selection. Ealy will have a difficult decision to make after the Cotton Bowl. He has drawn some early praise as an NFL prospect and will have to decide whether to declare for the NFL Draft or return to Columbia for his senior season. Braylon Webb was always around the ball this season, such as when he intercepted a pass against Tennessee. There are so many different players who we could have picked for this spot. Defensive end Markus Golden made an impact with 13 tackles for loss, seven quarterback hurries and 6 1/2 sacks. Linebackers Donovan Bonner and Kentrell Brothers both had their moments as well. Cornerback Randy Ponder also deserves recognition for his work opposite Gaines in the secondary. But we’ll go with Webb, a redshirt junior safety who was around the ball often, as his 85 tackles — second on the team behind Wilson — attest. His seven pass break-ups tied Ponder for the team lead, and he recorded two interceptions and 1 1/2 tackles for loss. Webb also established himself as a physical presence that opposing wide receivers had to respect when making their way across the field.